I woke up at 6 o’clock, just like every other day, exhausted after a night of little sleep. Our sixth month old woke up more than usual and our three year old ended up crawling into our bed about 30 minutes after I had fallen back to sleep post one of those midnight feedings. Once I finally got around to eating breakfast, I joined the kids in the backyard to enjoy the cool air while eating. Instead of enjoying the sounds of nature, I was met with two screaming children after they were told they needed to return the seat cushions to the patio furniture and that using them to skate across the gravel was inappropriate. The screaming was uncontrollable, and it wasn’t even 8am. We dragged them inside in effort to keep the neighbors from hearing the commotion. Once they were calmed, I went in to get dressed. Quickly I realized that I had neglected to move the wet clothes from the washer to the dryer last night and thus the shirt I had intended to wear was wet and no longer wearable. We had a playdate scheduled with a new friend at the park just across the street. The baby woke up from her morning nap too late, and it took more than the five anticipated minutes to walk to the park. Our agreed upon time came and went and we were still hiking our way through the neighborhood to get to our friends. At the park, my three year old son became “that” kid as he was putting sand in other kids’ hair and throwing rocks. When we left the park to pick up his brothers from yet another half day of school, he refused to leave the school office and almost ran out into the road. After reunited with brothers and back home, we were well past lunch time and no lunch was ready, the baby was screaming and ready for a nap, and I was sweating from hiking with four kids in tow through the 90+ degree heat to and from school. I got the baby down for a nap… but 15 minutes into it one of her brothers slammed a door and screaming erupted. You get the idea… today was a rough day. This morning I woke up to my six year old creeping into our bed and quietly whispering into my ear “I love you momma” before heading downstairs to watch cartoons with his brothers. I went into the nursery to get our littlest who was happily cooing in her bed. As soon as our eyes met, a smile washed over her face— the kind that doesn’t just change the shape of her mouth, but her eyes twinkle and her cheeks wrinkle. Once dressed I plopped the baby into the stroller and she, her oldest brother, and I went on a walk in the cool morning air. We returned to breakfast ready and the other boys playing outside. We ate on the patio as humming birds danced in the air. After an unfortunate cry-fest, my strong willed son didn’t just withdraw, but talked with me, hugged it out and was able to rejoin the family. Once the big boys got to school, the two littles and I walked to the park to meet friends. We played for hours, enjoying conversations, new friends, and sprinklers! Done at the park, we picked the big boys up from school (they had a half day). In the afternoon, we decided to take one last jump in the pool. The kids giggled and splashed as the chilly water made them shiver. Then we snuggled as we dried off in the sun. The day ended with movie watching, book reading, and singing songs as the boys fell asleep. Both of these lists are accurate, but only one is true. It is all about perspective. I had a choice in each moment to either focus on the challenges or the blessings. Each time I made the choice, it influenced what came next. As I was walking to the park, stewing over how we were running late and how that isn’t the way I wanted the first playdate with a new friend to go— I paused, took a deep breath and realized that being five minutes late didn’t have to ruin a day of fun. I took a few more deep breaths and decided to let the lateness go and focus on enjoying the fun to come— and it did, we had a blast. If instead I continued to stew, grumbled at Levi for holding us up, profusely apologized for our tardiness, and didn’t let go of the frustration it could have kept me (and my son) from fully enjoying the company we were blessed to have for the morning. 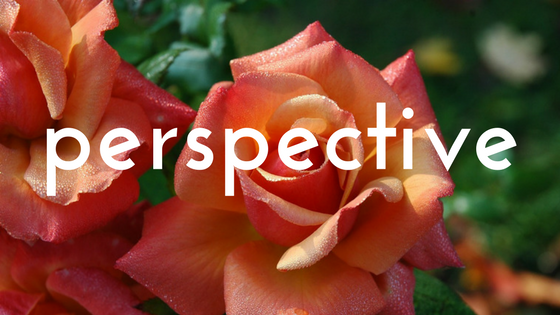 Each time a challenge arose, I could have let it change my perspective for the rest of the day. I didn’t. I intentionally tried to focus on the beauty, the blessing, the gifts that were presented throughout the day. Recognizing and celebrating those moments also influenced my perspective on the rest of the day— more beauty followed. May you see the good and beauty that is woven through the challenges and frustrations, and may you focus on that beauty.